Love the leading photo on this page. Any chance we could see more photo’s of your collection? Hi Adrian–I was actually thinking to add photos of different drawers and unit trays. Knowing there is interest might prompt me to do that sooner rather than later. Of course, they don’t look like the drawer in the leading photo – that’s an “oh, wow” drawer that I put together to hang on my office wall. Still, perhaps some photos of the actual working collection will be of interest. Royal Provincial Museum here in Alberta. I found that with on-screen enlargement it was still possible to read the labels. I have actually used these to I.D some of my insect photos. I realize you can’t post them at such a high resolution, but I still find a well pinned and labeled insect collection a pleasure to behold. Wow, Ted! That drawer just makes me drool! More! More! I can’t even fathom what 100+ drawers and 60 boxes looks like. Must be bug heaven! Wow, cool! I’m also very very very crazy about BEETLEs and I’ve collected some specimens in China, but they cannot match these huge species. Thank you for visting my blog. I like your site, in spite of my poor English. You’re professional, while I can only show photos with very simple description. Still I hope you like it. 75,000 specimens. Now that’s a collection! Hi Andrzej – many thanks! 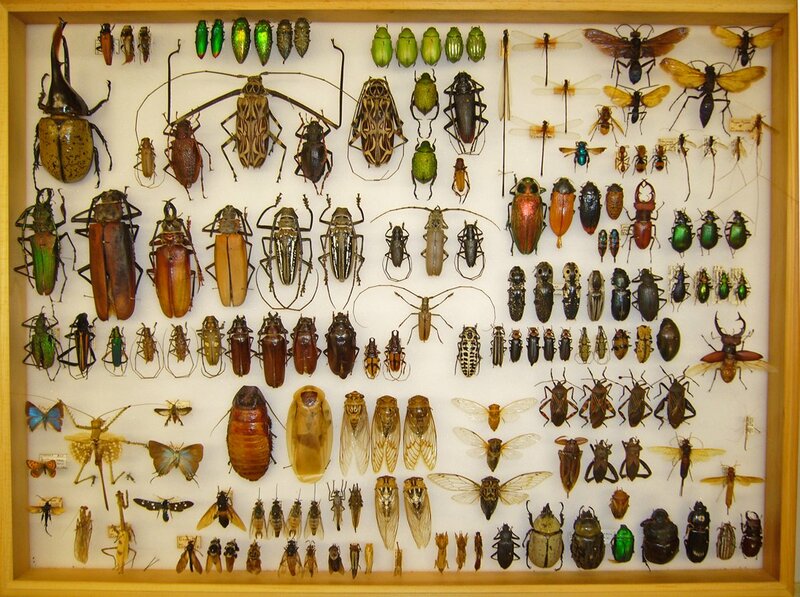 Like you, I’ve been collecting insects since I was a kid (I’m now 60 years old). In all those years, I’ve collected only one Buprestis rufipes. They’re supposed to be fairly common where I live (near Houston, TX) but I never see them. Any advice on how to find/capture them? Hi David. Thanks for stopping by. I had trouble finding Buprestis rufipes myself until I started looking for infested tree trunks and rearing them out. I have found this species breeding in trunks of standing dead slippery elm (Ulmus rubra) and pin oak (Quercus palustris) and a fallen, dead sugar maple (Acer saccharum). I think the size and condition of the wood is more important than the actual species, since it been recorded breeding in a variety of hardwoods. In each case where I found it, the trunks were large to very large (at least 8″ dia. and as much as 2′ dia. ), and the wood was in early stages of decay with the bark partly sloughed and the outer wood layer slightly softened. You can find specific collection records for this species in MacRae & Nelson (2003) and MacRae (2006). Good luck – it sure is a beauty! Hi Donny. You must, indeed, have some incredible beetle species in Indonesia. Yeah!!! !So many of them, nice and beautiful??!!! But, i’ve got a problem in identified it, like i said before, i’m not an entomologist, maybe you could figure it out!! Check my site here : http://www.borneokuwagata.blogspot.com.